157. What is at Stake with Roman Catholic Mariology? This is going to be a more personal Vatican File, based on some observations gathered in the last twelve months. After writing a book on Mary, I knew that I was going to present it on several occasions before different audiences and discuss its contents with numerous Roman Catholic theologians around Italy. Books are important tools for dialogue, and so I was prepared to engage in serious conversations in a variety of public settings. So did it happen. Over the last year I have had the privilege of talking about Mariology many times and in many places, meeting hundreds of people eager to listen, to ask questions, and to challenge my book. The last public presentation for this year took place in the city of Imola (not far from Bologna, in the north of Italy) only a few weeks ago. This experience gives me the opportunity to reflect on some unique opportunities that I have had and on some common threads that I have encountered so far. At Imola, the presentation took place in the impressive hall of the historic Episcopal Palace in the presence of the Roman Catholic bishop and more than seventy people, most of whom were committed Catholics of that city. Imola is the town where Giovanni Maria Mastai Ferretti (1792-1878) had been bishop since 1828 before becoming Pope Pius IX in 1846. Pius IX was the pope who promulgated the dogma of the immaculate conception of Mary (1854), the binding belief for Catholics according to which Mary was preserved from original sin, thus making her person unique beyond the service that God chose to give her in giving birth to Jesus. Pius IX was also the pope who convened the First Vatican Council (1870), which promulgated the dogma of papal infallibility. This same pope issued the harsh encyclical “Nostis et Nobiscum” (1849), against the spread of Protestantism in Italy, and the “Syllabus of Errors” (1864), with which he condemned Protestantism an illegitimate form of Christianity (Error N. 18). So, talking about Mary on December 5 (three days before the feast of the Immaculate Conception of Mary) in the hall that the then-bishop Mastai Ferretti had decorated and embellished, with a marble bust of an austere and inquisitive Pius IX staring down at me, in the presence of the current Roman Catholic bishop of Imola, was a spiritually strong experience. Under Pius IX the evangelization of Italy by the evangelical Protestants began; these believers were opposed, harassed, and persecuted in many ways. There I was, able to give reasons for the evangelical faith in a place from which its elimination had been desired. My dialogue partner was a learned and respected Roman Catholic theologian who teaches at various universities in Italy and across Europe. He had written twelve pages of notes on my book, showing that he had certainly read it very carefully. After my talk presenting Mary’s biblical portrait and the reasons for the evangelical criticism of Roman Catholic Mariology, ending with an invitation to go back to Scripture to have the Bible define our Mariology, the Catholic theologian explained with great wit the Catholic logic of Marianism: apparently motivated by the exaltation of the concreteness of the incarnation of the Son in the person of Jesus Christ, but really developed by incorporating affective and emotional codes linked to motherhood, the need for human proximity, the search for eminent life models, the idealization of female spirituality, etc. It became even more evident to me that Roman Catholic Mariology has its main raison d’être not in seeking a biblical foundation (even though the Bible is rhetorically evoked). Rather, its foundation is affective, emotional, and maternal. At the conclusion of the evening, a nun, visibly shaken and displeased, publicly asked me: “In short, how can you not pray to Mary? She is our mother after all!” Here, again, in this question and in this statement lies the whole of Roman Catholic Mariology. Mariology is not so much interested in biblical teaching but is enveloped in deep aspirations of the heart that are apparently not met by the living person of Christ, who has restored fellowship with the Father in the Holy Spirit. Here is another lesson that I learned at the end of this tour of presentations on the book on Mary. While it is vitally important for us evangelical theologians to work on biblical exegesis and theology to develop a biblical Mariology and to correct deviations and false teachings about her, we have to be aware of the fact that, historically and theologically speaking, Roman Catholic Mariology did not primarily originate from a reading of Scripture. Rather, it grew out of deep symbolic and “maternal” concerns. Exegetical arguments came after to retroactively support the Mariological devotions and the affection for her. This is to say that for Roman Catholic Mariology to be challenged and eventually undermined, we have to grapple with deeper issues than exegesis. In Mariology there are pre-theoretical commitments that exegesis does not intersect or intersects in a secondary way. It could even be argued that even if we win the exegetical argument, Catholic Mariology will still stand because its foundation lies elsewhere. As I came back from this presentation, another clear example of the pre-theoretical, deep, and emotional grounding of Mariology was evident in the official liturgy of the Act of Veneration that Pope Francis paid to Mary on the feast of the Immaculate Conception on December 8th in Rome. Queen of Peace, pray for us. There is much pre-theoretical commitment in this prayer that locates Mariology at the deepest level of psychological affections, far beyond exegetical and theological arguments. The latter are secondary at best. Thankfully, we no longer live in the time of Pius IX, and we are grateful for it. While all opportunities for respectful dialogue and friendly interaction with Roman Catholic friends need to be sought, it should be clear nonetheless that present-day Roman Catholic Mariology is still very much framed and encapsulated in an emotional setting that makes it hardly reformable according to the Word of God. “The Only Creature without Sin”. Pope Francis on the Immaculated Conception of Mary (2017). This book, which was recently translated into Italian and includes a new preface, does not break any new ground in terms of the pervasive presence of the cult of Mary in Francis’ spirituality. What is interesting, though, are the biographical details that help to explain the personal context of his “applied” Marianism. Born into a devout Roman Catholic family, the young Jorge Mario Bergoglio was exposed to the Marian dimension of the faith from his earliest days. He began praying using Marian prayers, and the first image he possessed was a little medal of Mary of Mercy. Marianism reached him intuitively as part of family life and was conveyed with deep affections and tender gestures. As Clodovis Boff argues, “the incubator of Mariology is the heart, not the mind” (p. 126). In the cult of Mary, experiences and feelings precede and dominate everything else. Bergoglio’s first experiences of the Catholic Church were in a parish run by the Salesian order and dedicated to Mary the Auxiliatrix, so his first impressions of what “church” meant were thoroughly Marian. The most influential priest in his childhood was one who would impart Marian blessings and recite Marian prayers when visiting the Bergoglio family. As a child, Jorge Mario would regularly bring flowers to the statue of Mary. At 19 years of age he decided to become a priest while praying in the Marian chapel of his parish church. His sweetest memories and most decisive moments were punctuated by the “presence” of Mary surrounding him. In a telling passage of the book, we are told that “Mary entered progressively and profoundly in his life, never to leave it again” (p. 49). After becoming a priest, Bergoglio marked his pastoral activities around Marian devotions. The most popular ones were the diocesan pilgrimages to the Marian sanctuary of Our Lady of Luján (whose image oversees the room where he meets with Catholic bishops from around the world at the Vatican). It is here that he leads thousands of people to the sanctuary of the Blessed Virgin of the Rosary of Pompei. He has become so close to Our Lady of Luján that he carries close to his heart a little piece of cloth that was used to polish her statue back in Argentina. He wants a physical, on-going touch with something Marian. “What joy I feel as I come to the house of the Mother of every Brazilian, the Shrine of our Lady of Aparecida! The day after my election as Bishop of Rome, I visited the Basilica of Saint Mary Major in Rome, in order to entrust my ministry as the Successor of Peter to Our Lady. Today I have come here to ask Mary our Mother for the success of World Youth Day and to place at her feet the life of the people of Latin America”. Yet another link to a centrally important Marian sanctuary in the life of the Pope is Saint Mary Major in Rome. He pays a visit there before and after his journeys around the world in order to commit them to Mary and ask for her protection. From childood to adulthood, from Argentina to the Vatican, from piety to theology, in his daily spiritual practices and devotions, Marianism is perhaps the most significant factor shaping the Pope’s life. The apartment he lives in is replete with Marian images. The rooms where he officially meets with people are furnished with portraits of Mary. His own daily clothes carry objects associated with Mary. His prayers are directed to her. His affections and tender thoughts are oriented to Mary. The interview is a wide-open window into Francis’ Mariological vision. All aspects of his life, thought, and ministry – none excluded – are strongly impacted by his Mariology. Of course, the pervasiveness of Mary is argued for in theological terms as well. For instance, Jesus is presented as someone who does not want to do all on his own but instead wants Mary to collaborate in the work of salvation (p. 45). According to the Pope, Jesus always acts according to “the logic of inclusion,” and Mary’s mediation is therefore an example of such necessary mediation. Since there are “organic links” between the Son and the Mother, she is always involved in what the Son does. It is the “principle of incarnation” that sustains and supports Marian devotions and veneration (p. 86). While Marianism has a primarily intuitive force and sentimental power, Mariology tries to connect it to Christology and therefore to Trinitarian theology, as Vatican II tries to do (Lumen Gentium 52-69). Quoting the 1979 Puebla document, the Pope goes on to say that “she is the point of contact between heaven and earth. Without Mary, the gospel becomes disembodied, defaced and transforms itself in ideology, in spiritualistic rationalism” (n. 301). So in this high Mariology, Christology is also at stake. If Mary is the point of contact between heaven and earth, isn’t Jesus Christ’s uniqueness as the God-man imperiled? If the gospel becomes disembodied without Mary, isn’t the incarnation of the Son blurred? A major assumption in most present-day ecumenical dialogues is that there is a solid agreement among all Christian traditions on basic orthodox Christology, and thus that Protestants and Roman Catholics share the same Christology. However, a reading of this book challenges this poor argument, which is nurtured by theological myopia, and invites us to take Roman Catholic Mariology seriously in all of its implications for Christology, salvation, grace, and prayer – in other words, the whole of theology and practice. If the Pope sees Mary everywhere, even when he thinks of Christ and the Trinity, salvation, and the Christian life; if Francis continually prays to Mary; if he strongly feels and seeks the maternal presence of Mary all the time; is his gospel a Bible-based, Christ-centered, and God-honoring gospel at all? Soon after Bergoglio became Pope Francis in 2013, one of the Argentinian theologians who had influenced him the most, Juan Carlos Scannone, said about him: “He will emphasize popular piety and spirituality, especially the Marian devotion which is so typical of Latin America” (p. 138). These words have proven true. Francis is promoting a “Marian” gospel that contradicts at fundamental points the biblical gospel of Jesus Christ. 147. Does Mariology Imply A Diminished Role for Jesus Christ and the Holy Spirit? One common refrain in ecumenical discourse is that all historical religious traditions (Roman Catholicism, Eastern Orthodoxy, various branches of Protestantism) differ in the way they understand salvation (e.g. justification, renewal, deification) and the nature/role of the church and the sacraments, but agree on the tenets of the Christian doctrines of the Trinity and Christology. While at one level this is formally true – each of these traditions adheres to the Apostles’ Creed – a deeper and closer look shows some cracks in this widespread assumption. Mariology is a testcase that provides an opportunity to see to what extent the Trinity and Christology belong to the shared faith. In the Roman Catholic tradition, at least, Mary is prayed to and is a venerated person surrounded by a vast array of “Marian” devotions, e.g. rosaries, processions, and pilgrimages. The titles with which she is referred to (e.g. Heavenly Queen, Mediatrix, Advocate) resemble those ascribed to her son, Jesus Christ. Mariology is also the theme of two recently promulgated dogmas (i.e. binding beliefs): the 1854 dogma of the immaculate conception and the 1950 dogma of the bodily assumption into heaven. Mariology impinges not only on the doctrine of Revelation, but also on the doctrine of the Trinity. While the outspoken intention of Roman Catholic Mariology is that Mariological doctrines and Marian practices in no way detract attention from Jesus Christ, the reality is that the line that Rome wishes to preserve is indeed crossed in multiple ways. When entire shrines or processions or prayer chains are dedicated to Mary so as to completely shape the devotees’ lives, one finds it hard to attribute it simply to the devotional excesses of poorly educated popular piety. Separating Christian worship duly expressed from cultish practices fraught with paganism is a soft, even liquid border line that is not maintained and safeguarded enough, despite the good intentions expressed in the official teaching. The question is whether or not Mariology as it currently stands, with its dogmatic outlook and devotional pervasiveness, involves an inherent proximity, if not blurring, with what is not biblically defendable. The indisputable evidence of many of these devotional acts and habits indicates that in many people’s lives the centrality of Mary is experienced much more than reverence and obedience to Christ. All this happens not in spite of what the Roman Catholic Church teaches but because of what it explicitly or implicitly endorses. Since the dogmatic pronouncement of the Council of Ephesus in 431 AD (when Mary was given the title of “Mother of God”) the Mariological trajectory has been strongly pushed forward in ever-expanding and almost self-referential terms. After Ephesus the veneration of Mary became prominent in devotional practices, doxological patterns, and the religious arts. Christianity went through a Marian shift in terms of liturgy and general orientation. The paradox was that the Council that wanted to re-affirm the full deity and humanity of Jesus ended up promoting a functional heresy. Individuals, groups, and movements began to develop quasi-obsessive Marian interpretations of the Christian faith and Mary became the figure most prayed to in daily life. She was not meant to detract attention from her Son, but her post-Ephesus perception functionally superseded Him in terms of experiential forms of Christianity. The Son always depicted in the company of the Mother, the Mother often portrayed as bigger than the (baby) Son, coupled with a growing prayer investment directed toward her, contributed to the gradual reconfiguration of Christian spirituality away from Christ (who began to be seen as too distant, too divine, too remote to be approached) and towards Mary with her maternal, tender, and compassionate attitude. Christ’s humanity – which is essential in recognizing his role as a mediator connecting the incarnate Son with us creatures – was progressively rarefied at the expense of His divinity. Christ’s divinity was eventually pushed to the forefront, making Him too far above to be invoked directly. The balance of the confession in the early creeds of Jesus Christ being “fully God, fully man” was nominally maintained but practically abandoned by the increasingly Marian spirituality of the post-Ephesus church. The vacuum left by the lack of appreciation for the humanity of Christ was filled by the growth of the role of Mary the Mother. The nearness of the Mother of God was the answer to the remoteness of the Son of God and even caused the Son to be perceived further as being too distant to understand and take care of the struggles of life. In other words, perhaps unintentionally, the Mother swallowed the Son. Orthodox Christology based on the Councils of Nicea (325 AD) and Chalcedon (451 AD) continued to be formally professed and defended; in reality, the appropriation of these Christological truths became a far too abstract discourse and of little spiritual benefit. What was practiced at the popular doxological level was an all-embracing Mariology that accounted for the spiritual needs of the people and whetted further theological development along Mariological lines. Mariology Obscuring the Work of the Spirit? There is more than that. In Trinitarian relationships, the work of the Son is strictly connected with that of the Holy Spirit. According to the Bible, the Son’s role as mediator is worked out by and through the Spirit. For example, it is the Spirit who helps us in our weakness by interceding for us in accordance with God’s will (Romans 8:26-27). Christ is the Mediator to the Father and the Spirit enables us to come to Him. What happened with the unchecked rise of Mariology? By pushing Christ’s humanity outside of the picture and filling the void with the intercessions of the Mother of God, Mariological development diminished also the role of the Holy Spirit by not recognizing His vital involvement in the mediatoral work of the Son. In becoming the figure nearer to the Son who could be always invoked and felt closer than the Son, Mary practically unraveled the bond between the Son and the Spirit and undermined the relationship between the faithful and the Spirit. The “gain” of Mariology was the “loss” of the Holy Spirit. The impressive growth of Mariology meant the disturbing disappearance of the Spirit. Marianism then obscured the nearness of the Son and froze the unique contribution of the Spirit. Beyond excesses in devotional practices – which are nonetheless intrinsically related to the nature of Mariology itself – the Roman Catholic view of Mary poses serious questions at the level of its Trinitarian implications. Formal adherence to the creedal basis of the person and work of Jesus Christ needs to be matched with a coherent spirituality centered on the praise of the Triune God —Father, Son, and Holy Spirit — something that does not happen in Mariology because of its inflated view of Mary and its consequent marginalization of Christ and the Spirit. In spite of the stated intention not to divert attention from the Son, Mariology tends to be an intruder into Trinitarian harmony and an obstacle to a full appreciation of who the Triune God is and what He has done for us. I am pleased to announce the publication of my new book. Make sure you get a copy! The Bible is full of inspiring characters and astonishing events. But, although Mary has without question one of the most wonderful stories, she can often be ignored – to be remembered only once a year at Christmas. This Pocket Guide title looks at the life and character of Mary – and her unique significance in the gospel story. Leonardo De Chirico has been involved in a church planting project in Rome and is now pastor of the church Breccia di Roma (www.brecciadiroma.it). He is lecturer of Historical Theology at Istituto di Formazione Evangelica e Documentazione (www.ifeditalia.org) and vice-chairman of the Italian Evangelical Alliance (www.alleanzaevangelica.org). 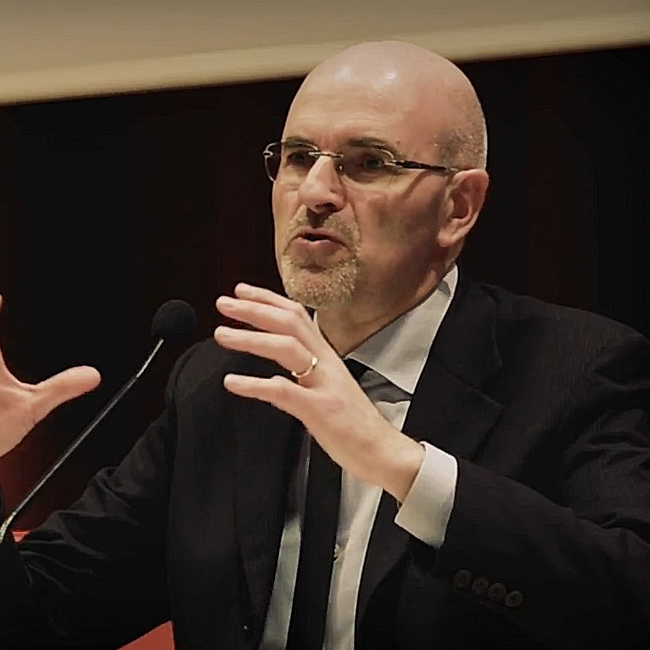 Leonardo De Chirico, one of the leading evangelical thinkers on Roman Catholicism, including its post-Vatican II phase, knows all the ins and outs of the history and theology of Catholicism, from years of study and first-hand experience in Padua and Rome. Against the temptation to think Mariology is just a side-show in Catholicism, he shows how it fits hand in glove with the Roman Church’s doctrine of grace. This is the book I have been searching for! De Chirico’s A Christian’s Pocket Guide to Mary is unique in clearly and succinctly bringing together in one place Mary in the Scriptures and Mary in the history of Christian thought and practice, right up to the present day. Rachel Ciano, Lecturer in Church History at Sydney Missionary and Bible College; church-planter in a multicultural, urban area of Sydney. Never before have I read a more masterfully written book on the subject. Leonardo De Chirico marries scholarship with an easily readable style that makes the book extremely useful both for personal and group studies. It is a concise and well researched masterpiece from one of the world’s leading experts on Roman Catholicism and recommendable both to Catholics and Protestants who want to understand one of the most misunderstood and controversial issues in Church History. Leonardo De Chirico is one of my most trusted authorities on Roman Catholic doctrine. He has gained my confidence because he is always equally charitable, winsome, and well-informed. In this short book he demonstrates what the Roman Catholic Church teaches about Mary and aptly proves why so much of it is opposed to the plain teaching of the Bible. I heartily commend it to you. This is an excerpt from the forthcoming book by Leonardo De Chirico, A Christian’s Pocket Guide to Mary: the Mother of God? (Christian Focus). Mariology is not a peripheral part of spiritual life for many religious people around the world. Intertwined with lofty dogmatic definitions, it is the practice of devotional and popular Marianism that largely defines the religious experience of many Roman Catholic faithful who pray to her and are devoutly committed to her. The Catechism goes as far as saying that “the Church’s devotion to the Blessed Virgin is intrinsic to Christian worship” (971). It also implies that when dealing with Marian devotion, one touches a central nerve of the whole of Christian spirituality, not something that can be dealt with independently. So far, in looking at the development of Mariology throughout the centuries, and the incremental theological significance attached to it, the focus has been both historical and theological. At this point, we want to concentrate on the manifold aspects of Marian devotions to appreciate their phenomenological variety, religious depth, and social pervasiveness in people’s lives. Prayer to Mary is what quintessentially defines Marian spirituality. Mary is perhaps the most invoked figure in many religious quarters. As an acclaimed mother, she is movingly sought by those seeking help and strength. As she is eminently given veneration, she is approached with reverence and awe. As she is magnified with extravagant titles, she has centre stage in peoples’ hearts. An entry point into the world of Marian prayers is the collection put together by Alphonsus Liguori (1696-1787). Liguori, an Italian Catholic bishop who was proclaimed saint in 1839 and eventually Doctor of the Church in 1871, spent many years gathering the best material on Mary he could find from various sources that were used in the liturgical practice of the church. In his book, Liguori explains that Mary is “our life, our sweetness and our hope,” and goes on to argue that Mary’s intercession on our behalf is powerful to the point of enabling sinners to regain the state of grace. Mary can be approached confidently because she can obtain for us from her divine Son anything she asks for. Moreover, devotion to her is a most certain mark of eternal salvation. This book has been shaping Marian devotions since becoming the reference point for subsequent Mariological reflection. Against the background of such deep theological and devotional vision, the list of prayers mirrors a Marian-centred spirituality: “Hail Holy Queen”, “Regina Coeli” (Queen of Heaven), and “Ave Maris Stella” (Hail Star of Ocean) are only few of the most common and popular Marian prayers. Another significant form of Marian prayer is related to the Rosary. The word rosary means “crown of roses”. The conviction behind this expression is that Mary has revealed to several people that each time they say a “Hail Mary” they are giving her a rose and each complete Rosary makes her a crown of roses. The rose is the queen of flowers, and so the rosary is the rose of all devotions and therefore the most important one. The Holy Rosary is considered a perfect prayer because within it is the awesome story of salvation retold in a way that highlights Mary’s central role in redemption. With the Rosary, devotees meditate on the mysteries of joy, sorrow, and the glory of Jesus and Mary, thus internalizing the blurred analogy between Mary and the Son. Gone is the story of salvation through Christ’s death and resurrection as the Bible tells it. Instead, the Rosary is a powerful tool to shape one’s own imagination in terms of the pervasive presence and agency of Mary in whatever the Triune God is and does. The whole orientation of Roman Catholic “biblical theology” is inherently Marian, in that Mary is thought of as sharing the prerogatives and roles of the Son. Marian devotions profoundly shape the life of prayer, religious arts, the arrangement of sacred space and time, the imaginations and emotions of people, even becoming a reference point in mapping global territory. In all its theological force and devotional ramifications, Mariology is an inescapable, all-embracing, and fundamental tenet of Roman Catholic theology and practice. Moreover, it is a deeply troubling development because it is impossible to see a linear and coherent connection between this Marian devotion and the more sobering account of what the Bible actually says about Mary. Part of this collection can be found in St. Alphonsus Liguori, Hail Holy Queen. An Explanation of the Salve Regina (Rockford, IL: Tan Books and Publ., 1995). A full explanation of the significance of the Rosary can be found in John Paul II’s Apostolic Letter Rosarium Virginis Mariae (2002): https://w2.vatican.va/content/john-paul-ii/en/apost_letters/2002/documents/hf_jp-ii_apl_20021016_rosarium-virginis-mariae.html. The Papal visit to Korea (August 13th-18th, 2014) was his first trip to Asia and many commentators have already highlighted different geo-political aspects of it. Asia is one of the most promising regions in the world for the Roman Catholic in terms of potential growth. This is the reason why Pope Francis will visit Sri Lanka and the Philippines in January of 2015. Asia is inevitably related to China, where there is an on-going diplomatic challenge for the Vatican and its prudent attempt to deal with the Chinese government and the unsettled situation of Christian churches there. This is why Francis extensively spoke on the theme of “dialogue” and the fact that Christians in no way intend to “invade” anyone or any place. He was in Korea but certainly had China in the back of his mind and wanted to send a message there as well. Korea itself is a divided nation and the Pope addressed the painful memories and the reality of the separation between North and South Korea. On a more symbolic level, Asia is also very evocative for Jesuits in general. Five centuries ago Matteo Ricci (1552-1610) was the first Jesuit to go to China, and so the Jesuit Pope also feels the Asian attraction that is typical of many Jesuits. Geo-political considerations aside, there were two main spiritual emphases of the visit: the usual Marian framework of Pope Francis and the elaboration of his missional view as far as the discipline of dialogue is concerned. This File concentrates on the first item while another one will deal with the second. The Papal visit coincided with the Asian Youth Day but most importantly with the solemn celebration of the assumption of Mary, body and soul, into the glory of heaven (August 15th). This Marian dogma was promulgated in 1950 and fits very well the overall spirituality of Pope Francis. In his homily during the celebration he invited the Korean audience “to contemplate Mary enthroned in glory beside her divine Son”. He called Mary “Mother of the Church in Korea” asking her help “to be faithful to the royal freedom we received on the day of our Baptism”. The queenly glory of Mary was coupled with the motherhood of Mary for the whole nation of Korea. Although the Bible teaches that “God is our refuge and strength, a very present help in trouble” (Psalm 46:1), it was Mary that was presented to the faithful as an ever ready helper on the spiritual journey. In praising Mary, the Pope went on to say that “In her, all God’s promises have been proved trustworthy”. Actually, the Bible says that “all the promises of God find their Yes in Him”, i.e. in Christ (2 Corinthians 1:20). This is an example of how the logic of Catholic Mariology works its way through: it takes what belongs to Christ and extends it to his mother, although the Bible does not prescribe nor does it allow such an extension to take place. The final invocation was also telling: “And now, together, let us entrust your Churches, and the continent of Asia, to Our Lady, so that as our Mother she may teach us what only a mother can teach: who you are, what your name is, and how you get along with others in life. Let us all pray to Our Lady”. Again, the motherhood of Mary was strongly emphasized to the point of attributing the discovery of our identity to her instead of Christ in whom we are saved and through whom we have received a new name. In so doing Mary joins Christ with the risk of taking his place. Obtaining the Grace of Perseverance? A final comment on the Mariology of the Papal visit is in order. During the Mass for the beatification of 124 Korean martyrs (August 16th), Francis ended his homily with these words: “May the prayers of all the Korean martyrs, in union with those of Our Lady, Mother of the Church, obtain for us the grace of perseverance in faith and in every good work, holiness and purity of heart, and apostolic zeal in bearing witness to Jesus in this beloved country, throughout Asia, and to the ends of the earth”. The idea is that the prayers of those whom the Church proclaims to be blessed “obtain for us the grace of perseverance”. Perseverance seems to be a human “work” that is obtainable through the efforts of the living and the dead. In returning to Rome, after the long flight from Korea, Pope Francis stopped on his way to the Vatican at the basilica of Saint Mary Major, the largest Marian church in Rome, to thank Mary for the successful results of his trip to Asia. Saint Mary Major was the first church the Pope ever visited after becoming Pope and the dedication of his pontificate to Mary was the first official act of his reign. This church and what it represents is very dear to the him. The point is that Francis’ seemingly biblical language and “evangelical” attitude is always thought of and lived out in a thoroughly Marian framework, in both Rome and Korea alike. Francis’ Marian devotion is one of the defining marks of his spirituality. From his very first acts as Pope to his daily speeches and practices, traditional Marian theology is basic to his Catholic worldview. To evangelical ears his language may at times seem Christ-centered and mission-oriented, but these apparent gospel emphases are always organically related to a strong Marianism that envelops the Pope’s religious narrative and experience. The latest example of his profound Marianism occurred in a meeting with the seminarians in Rome on May 13th. In answering their questions on various topics, the Pope made some interesting comments on the Marian framework that undergirds his theology of the Christian life. Commenting on the need for vigilance in times of personal turmoil, Francis evokes the counsel of the Russian Fathers to run “under the mantle of the Holy Mother of God”. This Marian protection – the Pope recalls – is also part of the liturgy whereby the faithful declare to find refuge under the “presidium” (haven) of Mary: “sub tuum presidium confugimus, Sancta Dei Genitrix”. So, for a priest not to pray to Mary in times of difficulty is for him to be like an “orphan”. When in trouble the first thing a child does is look for his mother, so too should it happen in the spiritual realm. The mediatorial work of Jesus Christ and his total understanding of our needs (the whole point of Hebrews 1-2 and 4:14-16) is here totally overlooked and is instead subsumed under the protection of Mary who is the caring mother of those seeking help. Whereas the Psalmist can cry “For God alone, o my soul, wait in silence, for my hope is from Him” (Psalm 62:8), Francis’ advice is to seek the “mantle” of Mary. The Pope then goes on to underline the link between the motherhood of Mary and the motherhood of the Church. According to him, those who have a “good relationship” with Mary will be helped to have a “good relationship” with the Church and even with their own souls. All three have a “feminine element” which connects them in a transitive and motherly way. Again there is strong emphasis on motherhood that runs through the Mariological worldview. Those who do not have a good relationship with Mary (assuming that this means praying to her, trusting her and seeking her help) are like “orphans”. The Bible, however, teaches that a good relationship with the Church is made possible only through the head of the Church, that is Jesus Christ, and this comes through the Holy Spirit (1 Corinthians 12). Francis, on the other hand, has a “motherly” way of getting that relationship right. At this point the Pope recalls an episode that happened to him while visiting a family in Northern Europe thirty years ago. The members of the family were practicing Catholics and full of enthusiasm for Christ (perhaps influenced by the Protestant culture of their region?). In a conversation they said: “We have discovered Christ and – thank God – we have passed the stage of Madonna. We don’t need her any longer”. “No”, replied the saddened Bergoglio: “This is not a mature faith. Forgetting the mother is always a bad thing, not a sign of maturity”. Again, the question arises: is finding Christ and him alone a step towards or away from Christian maturity? The last comment concerning this question seems more like a humorous joke. In wrapping up his Marian reflection, Francis concludes by saying “If you don’t want Mary as a mother, she will become your mother-in-law!” An intriguing way of further expanding the motherhood metaphor in non biblical directions. The point is that pope Francis believes that a Mariologically-free or even Mariologically-light faith is an orphan-like and immature faith. The real question is whether or not a Christ-centered and mission-oriented faith should focus on Christ instead of intermingling the Gospel with various motherhood ideas that obscure it. Vatican Files is a project of the Reformanda Initiative. 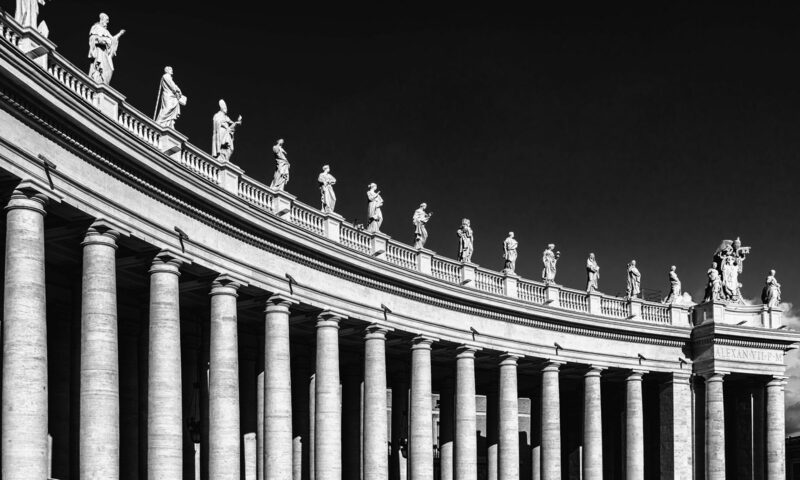 We exist to identify, unite, equip, and resource evangelical leaders to understand Roman Catholic theology and practice, to educate the evangelical Church and to communicate the Gospel. 2019 RSLN - now accepting applications! Leonardo De Chirico (1967) planted and pastored an Evangelical church in Ferrara (northern Italy) from 1997 to 2009. Since 2009 he has been involved in a church planting project in Rome and is now pastor of the church Breccia di Roma (www.brecciadiroma.it ). 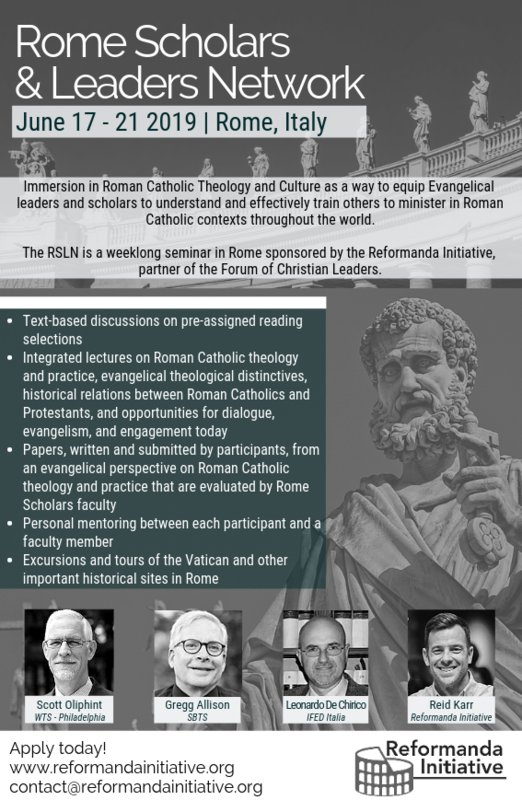 Additionally, Leonardo is the Director of the Reformanda Initiative, which aims to equip evangelical leaders to better understand and engage with Roman Catholicism, and the leader of the Rome Scholars Network (RSN). He earned degrees in History (University of Bologna), Theology (ETCW, Bridgend, Wales) and Bioethics (University of Padova). His PhD is from King’s College (London) and it was published as Evangelical Theological Perspectives on Post-Vatican II Roman Catholicism (Bern-Oxford: Peter Lang 2003). 160. Is the Nicene Faith the Basis for Ecumenism?